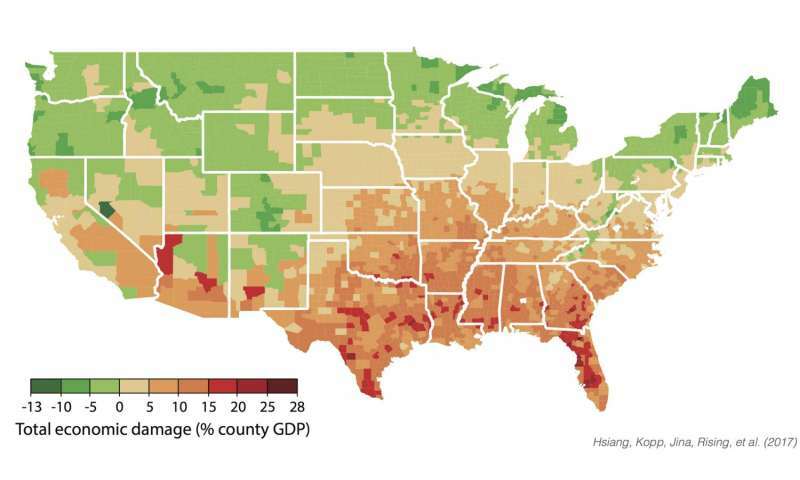 "Unmitigated climate change will be very expensive for huge regions of the United States," said Hsiang, Chancellor's Associate Professor of Public Policy at UC Berkeley. "If we continue on the current path, our analysis indicates it may result in the largest transfer of wealth from the poor to the rich in the country's history." "In the absence of major efforts to reduce emissions and strengthen resilience, the Gulf Coast will take a massive hit," said Kopp, a professor of Earth and Planetary Sciences at Rutgers University-New Brunswick. "Its exposure to sea-level rise—made worse by potentially stronger hurricanes—poses a major risk to its communities. Increasingly extreme heat will drive up violent crime, slow down workers, amp up air conditioning costs, and threaten people's lives." If emissions growth is not slowed, then the resulting 6-10°F (3-5°C) of warming above 19th century levels projected for the last two decades of this century will have costs on par with the Great Recession—except they will not go away afterwards and damages for poor regions will be many times larger. "The 'hidden costs' of carbon dioxide emissions are no longer hidden, since now we can see them clearly in the data," said Jina, a postdoctoral scholar in the department of economics at the University of Chicago. "The emissions coming out of our cars and power plants are reshaping the American economy. Here in the Midwest, we may see agricultural losses similar to the Dustbowl of the 1930s." County-level annual damages in the median scenario for the climate from 2080 to 2099 under a business-as-usual emissions trajectory. Negative damages indicate economic benefits. Credit: Hsiang, Kopp, Jina, Rising, et al (2017). The study is the first of its kind to price warming using data and evidence accumulated by the research community over decades. 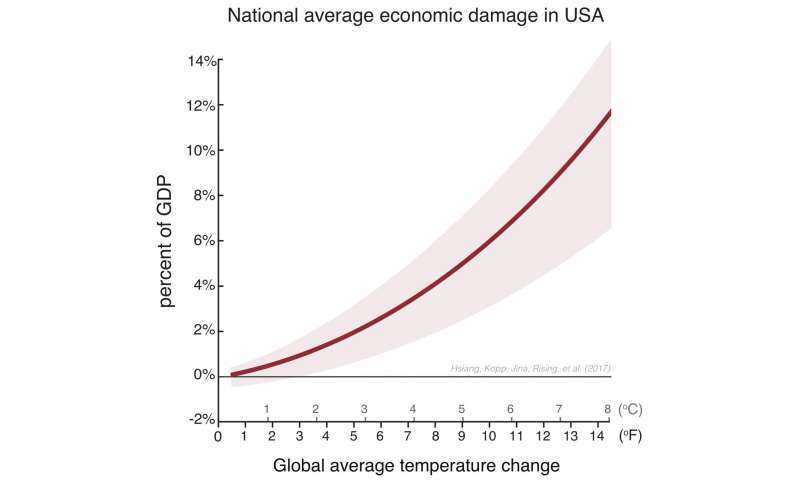 From this data, the team estimates that for each one degree Fahrenheit (0.55°C) increase in global temperatures, the U.S. economy loses about 0.7 percent of Gross Domestic Product, with each degree of warming costing more than the last. This metric can help the country manage climate change as it does other systematic economic risks - for example, the way the Federal Reserve uses interest rates to manage the risk of recession. "We could not have done this study without the ongoing revolution in big data and computing," said Rising, a Ciriacy-Wantrup Postdoctoral Fellow at UC Berkeley, describing the 29,000 simulations of the national economy run for the project. "For the first time in history, we can use these tools to peer ahead into the future. We are making decisions today about the kinds of lives we and our children want to lead. Had the computing revolution come twenty years later, we wouldn't be able to see the economic hole we're digging for ourselves." This is crazy. The abstract states "Here, we develop a flexible architecture for computing damages that integrates climate science, econometric analyses, and process models. 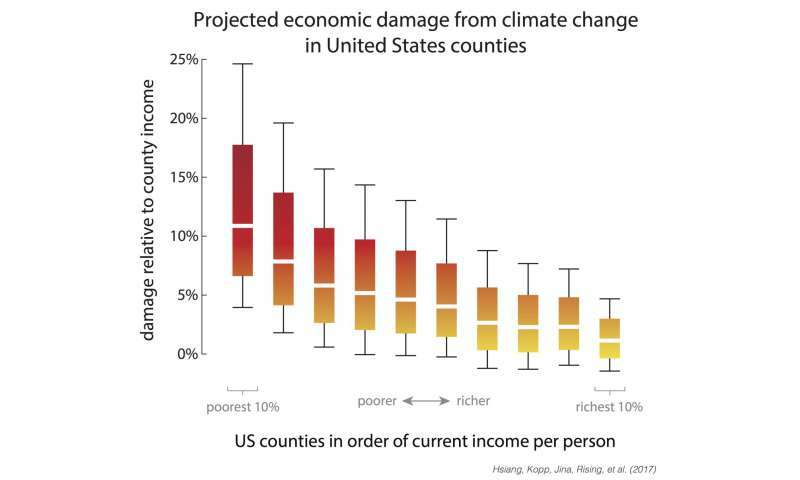 We use this approach to construct spatially explicit, probabilistic, and empirically derived estimates of economic damage in the United States from climate change. The combined value of market and nonmarket damage across analyzed sectors—agriculture, crime, coastal storms, energy, human mortality, and labor—increases quadratically in global mean temperature...."
Along with Al Gore this deserves a Nobel prize. What is the science behind this statement? Do hotter countries like India have in general more violent crime? Doesn't sound right. Again, do hotter countries have worse health?? "Scientists" have been predicting intensifying hurricanes for decades...to no avail. Why should we believe these "scientists"? I like their evasion to the rainfall topic, calling it "changing"! Like "Global Warming" became "Climate Change". This gives them much more leeway to say in the future, "See, it changed!!" It is a cop-out. They don't know what is going to happen, and surely more rain in dry areas will be a huge boon to the economy. But they don't want to think of such scenarios much. The latest massive fail by global warmists was that the Great Lakes were drying up. Lake levels just reached 100 year highs. Do these people ever tire of being wrong? Also, FAR MORE people die in cold than warm weather, almost 100,000 more in Europe each winter than if winter hadn't happened. Think about it. I think that we are graduating way too many climate scientists. If students cannot find a better way than this to utilize their expensive education they need to be at the other end of a shovel where they could actually be performing useful work. "then the resulting 6-10°F (3-5°C) of warming"
This is skewed, realistically there's less to 1 degree F change predicted by end of the century due to "climate change"
There's seems to be a lot of assumptions in this article. I knew I'd find all you deniers here, just waiting for MR166. It's not crazy, and you gave no reason why it would be. Quoting their abstract is not a sign they or their analysis are crazy. Hotter countries do have worse health. Malaria, cholera, typhoid, dengue, bad water, famine, etc. kill millions in hot, poor countries. Pointing to Europe is a red herring; those countries are cold and wealthy, completely. Where on earth did you come up with that 100,000 figure? I don't know what the science is behind the statements about crime, but my mind isn't closed. I would read the article and study the science before deciding; you just decided it's wrong a priori. But there is a strong connection between extreme poverty and crime, so anything increases the one will lead to the other. How is "changing rainfall" an evasion? Did you personally put a question to these authors? I have always heard the scientists saying patterns of precipitation would change, not that rain would stop. Where do you come up with only 1 degree F of warming? All reputable sources say we will blow past 2 C on the current course; we can keep it below that only if we drastically curtail the damage we are doing now. You have nothing to back up your statements at all. More on the changing precipitation. I work at a university, and one of the professors I worked with studies precipitation in California. He and his colleagues put a network of sensors throughout the Sierra Nevada. The data he had collected ten years ago showed that the pattern of precipitation had already changed. Total precipitation didn't change, but a greater percentage of it came down as rain instead of snow. That changes the amount of water that is in the rivers in each season (more in winter and spring, much less in summer and fall). That affects plants and animals and agriculture throughout the state. Anything that relies on a certain level of water during a particular season (which is almost all of them besides humans) will be affected, and could be driven to extinction in short order. No water during spawning season = no fish = disrupted food chain. It also changes erosion patterns, directly affecting your precious property values. Well then a little cooling is good eh? Oh I see. If I give the climate scientists enough money they will guarantee a Goldilocks climate, not too warm and not too cold. The scientists will not get the money. As soon as the technologies are ready, Wall Street and the CEOs will figure out the best way to exactly what they have always done, siphon all the money out of the public coffers and into the new industry of climate modification. Extracting money from individuals to insure and hedge against changes that they caused, extracting from governments for infrastructure and subsidies and tax breaks, building profit models off of everything new. The rich will get richer, and you, their pawns, will stay put. What would you like to bet that the guy who came up with the math for this article know how to solve Differential Equations? Well then MR sticky sick, how many articles have you seen published right here on Porg that have either predicted or detailed the effects of arctic air excursions into temperate regions due to jet stream instabilities caused by AGW? Answer: over and over and over again. Since the blog you linked tries to make just such a predicted event speak for a new Ice Age in the face of these facts is a clear indication that you hope to peddle your Denierside antiscience claptrap. For the millionth time already-- this is a SCIENCE site, not a Deniersphere blog, and your(almost certain) paid persistence is an affront to each and every serious reader of these articles. "Well then MR sticky sick, how many articles have you seen published right here on Porg that have either predicted or detailed the effects of arctic air excursions into temperate regions due to jet stream instabilities caused by AGW? " According to climate science pretty much every bad thing that happens in the world is caused by AGW. It is the only "science" that is unfalsifiable. How come news journalists always reference the Great Depression and the Great Recession? How come news journalists never look for the positive effects of anything? If global warming will harm the economy, then how come the first graphic chart citing the economical damage that global warming will cause looks more like the chart of the prices of every stock index in the U.S. right now? Also, how do these analysts expect to predict the ramifications of global warming on the economy in such a distant future? People do realize that these are the same sources that incorrectly predicted the Trump presidential win. How could you expect them to predict the future so many years in advance when they already have a terrible track record predicting events in the near future? The silver lining (a saying you never read) is that the commenters are slowly starting to learn over time. This article a year or two ago would have been 100% biased toward predictive belief. That's quite the snarl of generalizations you've got there, "MR" sticky sick! "My gal is red hot. You're gal ain't doodley-squat! That would be more in your idiom, I'm sure, and would just as clearly and reliably indicate your level of intellectual prowess. Caliban there is no real need to make a detailed list of everything that has been attributed to AGW. If you chose not to remember the papers that is your problem. More, less, no snow, more hurricanes, fewer but more intense hurricanes , more rain, less rain. more frost, less frost, increased crime, mass immigration, income inequality and a host more are all on the list of AGW effects. What is the science behind this statement?